In our previous two posts relating CET anomalies to global temperature anomalies – for July to December here and for January to June here. To finish the survey this post will give an overall examination of the observed correlations for each month and for all months. 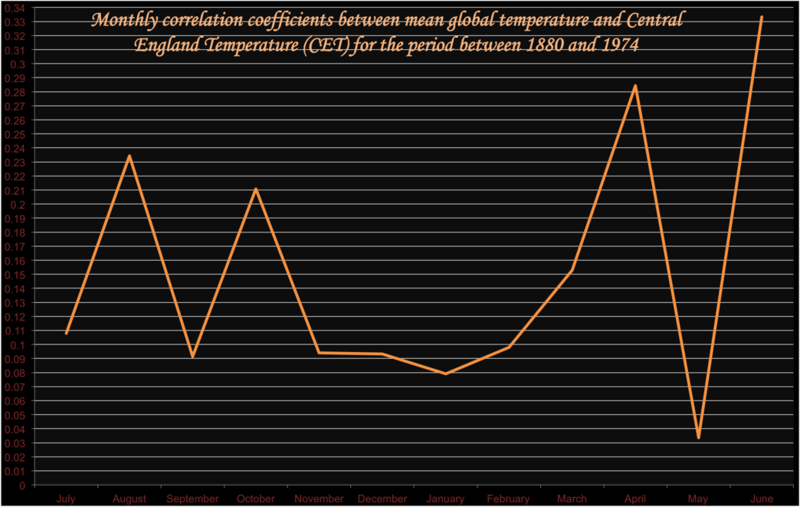 The first step will be to graph the observed CET anomaly versus global temperature anomaly correlation coefficients between 1880 and 1974 for each of the twelve calendar months. They are arranged in fiscal year order in the graph to fit in with my previous research on CET – a choice made because temperature anomalies are larger in winter than in summer. If we look at the graph closely, hypothesis (2) appears the most nearly supported of the three, because the maxima in April and June on the extreme right of the graph (which covers one fiscal year) would even if smoothed out with the very low coefficient for May still show a maximum three month mean of around 0.22 – well above any monthly value between November and February when CET and EWP correlate positively. During these months, the correlation coefficient is relatively consistently around +0.09. A likely conclusions is that, for the summer months when natural variability is lowest, a sample size of ninety-five years is too small to give accurate correlations at the monthly level. When variability is lower at the local level, smaller changes in temperature can have more effect on the anomaly, especially upon its sign. If this be so, then we can conclude that over an adequately long period, the correlations between CET and global mean temperature would trough in the winter months at around +0.09. What value they would take in months with negative EWP versus CET correlations (April to September) is less certain. The graph above shows +0.11 and +0.21 as the plausible limits, but what to expect is not certain. We cannot test any years before 1880 since I cannot gain access to compatible values of global temperature anomaly. Testing the post-1974 period is a possibility to expand the sample size, but I am too wary that global warming via greenhouse pollution out of Australia, the Gulf States and South Africa will have distorted the results vis-à-vis the relatively consistent climate of the 1880 to 1974 period.